Chester FC Community Trust is looking for enthusiastic and talented coaches to join our growing team. This is an exciting opportunity for highly motivated coaches who are passionate about creating opportunities and the power of sport to positively impact people’s lives. The key role of Community Coach is to plan and deliver high-quality coaching sessions to a broad range of participants and support the development of new programmes targeting increased participation. As well as delivering outstanding sessions, the successful applicant will also be expected to maintain and develop excellent relationships between Chester FC and our partners in the community including schools and clubs. Applicants must have a minimum of an FA Level 1 in Coaching Football qualification and will ideally be members of the FA Licensed Coaches’ Club. Experience of delivering in school or club environments is essential and a recognised coaching qualification in another sport would be an advantage. Please note due to the variable demands of the role, this is a casual post and will involve evening and weekend work. • To deliver coaching sessions that are participant-centred, structured, progressive, fun and of a high quality. • To undertake administrative tasks associated with the post, including planning sessions, taking registers, consent forms and contacting clubs and schools. • To build relationships with partners such as schools and clubs, and liaise with them to ensure they remain happy with the coaching service provided. Applicants must complete an application form. Unaccompanied CVs will not be considered. For further information please contact Jim Green via jim.green@chesterfc.com. 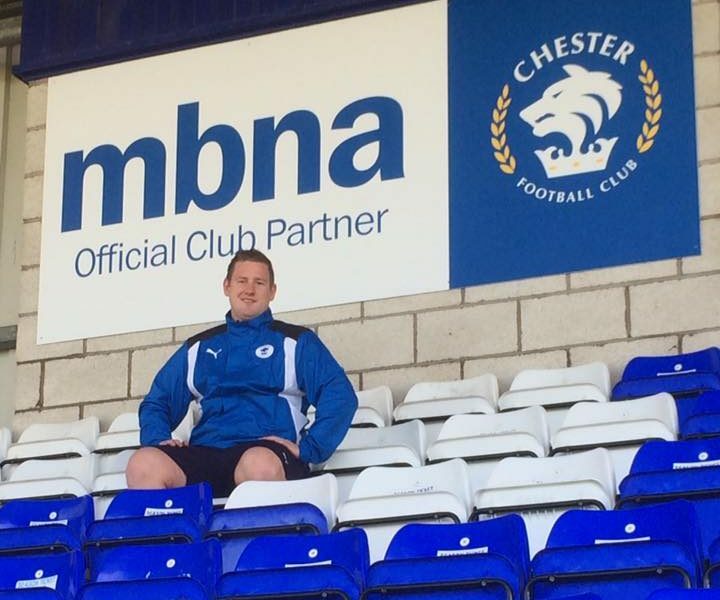 Andrew Ruscoe is to leave his post as schools’ partnership co-ordinator with Chester FC Community Trust at the end of this month. Andrew is stepping down after accepting a full-time position with the Motivational Preparation College for Training, however he will remain with the Trust as a community coach. During his time in post, Andrew has worked hard to establish and improve relationships between the Club and primary and secondary schools across the area, and delivered the anti-social behaviour awareness project Get Onside. Jim Green, chief executive of the Trust, said: “We wish Andy well for the future and thank him for his efforts over the past nine months. “His passion and enthusiasm ensured he made quite an impact and I know this decision has been a very difficult one for him, but we’re pleased he’ll be continuing as part of our coaching team. Andrew said: “I’m very grateful for the opportunity to be part of such a special club that is close to my heart and it’s been an amazing experience. Community clubs and schools can enjoy the ultimate matchday experience as Chester FC Community Trust’s Team of the Week. 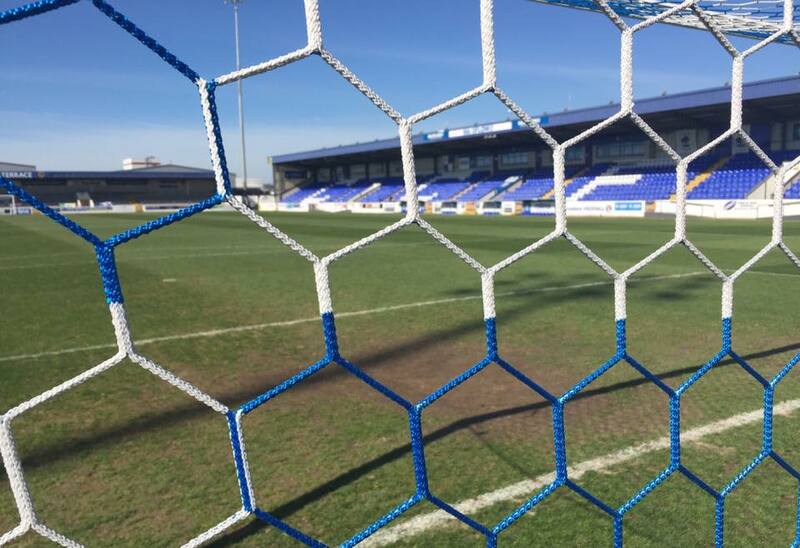 Each home match sees a junior team going behind the scenes at the Swansway Chester Stadium, visiting the dressing room to meet manager Jon McCarthy and his squad, learning about the history of the stadium and the Club, and even getting the chance to play on the hallowed turf before watching the Blues in action. The Team of the Week experience costs just £30 per team or school, which includes two tickets for coaches and 16 players’ tickets. Additional parent tickets can be purchased at the reduced rate of £10 and siblings for £3, ensuring a great day out for the whole family. Meet staff, players and our friendly mascot, Lupus! Watch the mighty Chester FC! With the 2017/18 season kicking off on August 5, bookings are now being taken for National League fixtures and a list of available matches can be requested from steph.oscroft@chesterfc.com. Allocations will be made on a first come first served basis as home games are limited for the season. 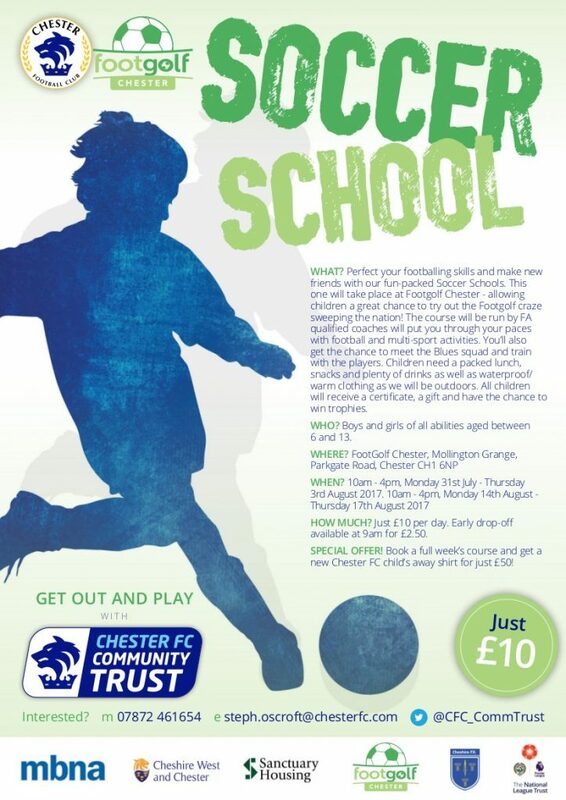 Chester FC Soccer Schools are back for the summer with four weeks of football, fun and top class coaching. With a new venue and a special offer giving parents the chance to book a week’s course and get a new Chester FC children’s away shirt all for £50, there’s an added incentive to sign up for youngsters who want to be the next Ross Hannah or Craig Mahon. 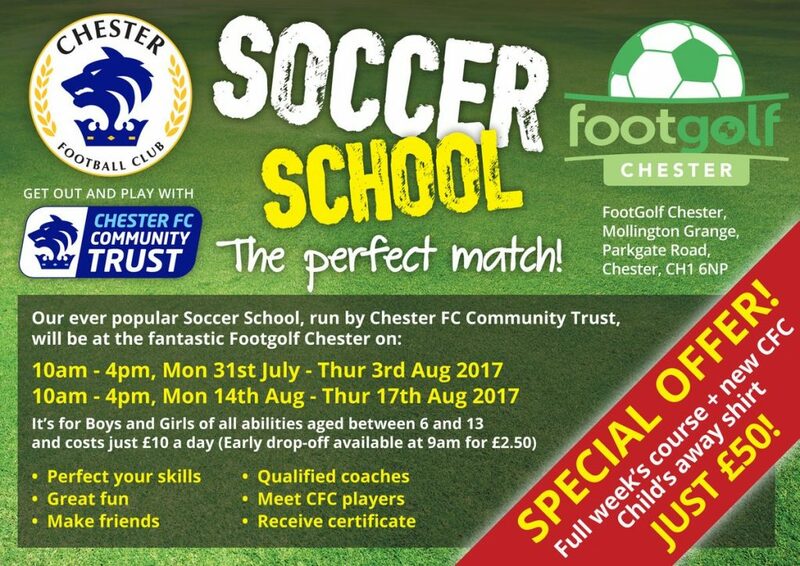 Four-day courses take place at The Cheshire County Sports Club in Upton and for the first time at the fantastic Footgolf Chester in Mollington from Monday 31st July to Thursday 24th August. Open to boys and girls of all ages and abilities, courses are only £10 per day and run from 10am until 4pm each day, however there’s an optional early drop off available from 9am for £2.50. Youngsters can perfect their skills and develop new techniques through drills, games and tournaments with FA qualified coaches – and will have opportunities to meet manager Jon McCarthy and the Blues’ first-team squad. All participants will receive a certificate and those who attend a full course will receive a medal. Participants will need a packed lunch, snacks, lots of drinks as well as suitable footwear, shin pads and appropriate clothing. Online booking is available through Eventbrite (additional booking fee applies) at community.chesterfc.com/book-online. 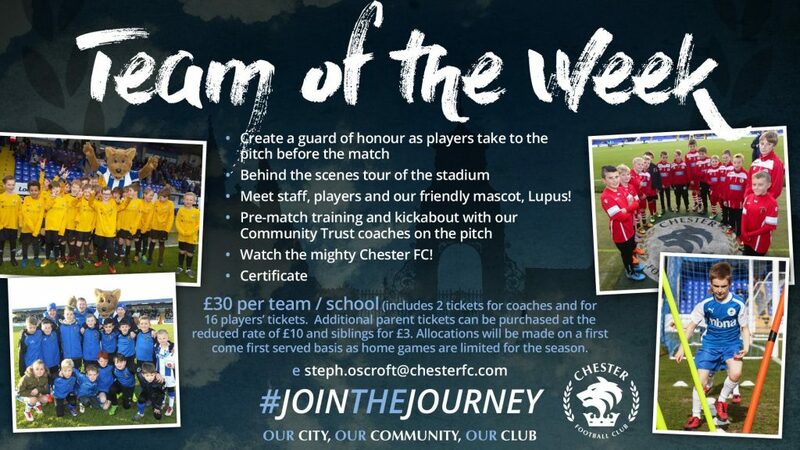 To book or for more information, contact Chester FC Community Trust on 07512 355396 or email community@chesterfc.com. 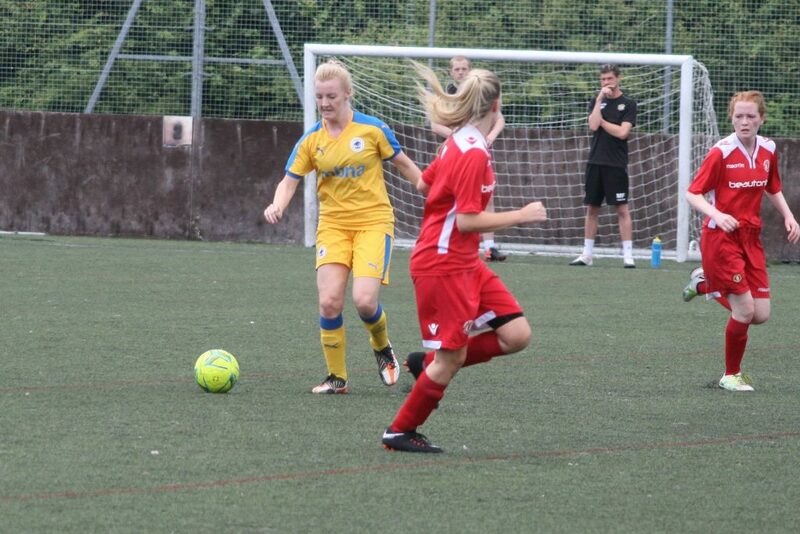 Chester FC Women began their pre-season schedule with a 4-1 victory over a Crewe Alexandra Ladies XI at the Alex Soccer Centre in Shavington. Emma Gray headed the Blues into the lead on her debut when she connected with a fine Rachel Lever cross and Lever doubled the lead with a smart finish from a Debs Trayner through ball to make it 2-0. Chester moved 3-0 up when Traner netted in confident fashion with Gray claiming the assist and although Crewe pulled one back with a smart strike from distance, the visitors secured the win in the closing stages when Trayner got her second from captain Lauren Stringer’s knock down. It was a disciplined and promising performance from the squad against a very talented Crewe side with all players getting a run out in the sweltering heat including a number of new signings. Next up for the Blues is a testing trip to Merseyrail Bootle on Thursday July 13th before a visit to Llandudno Ladies on Sunday, July 16th. 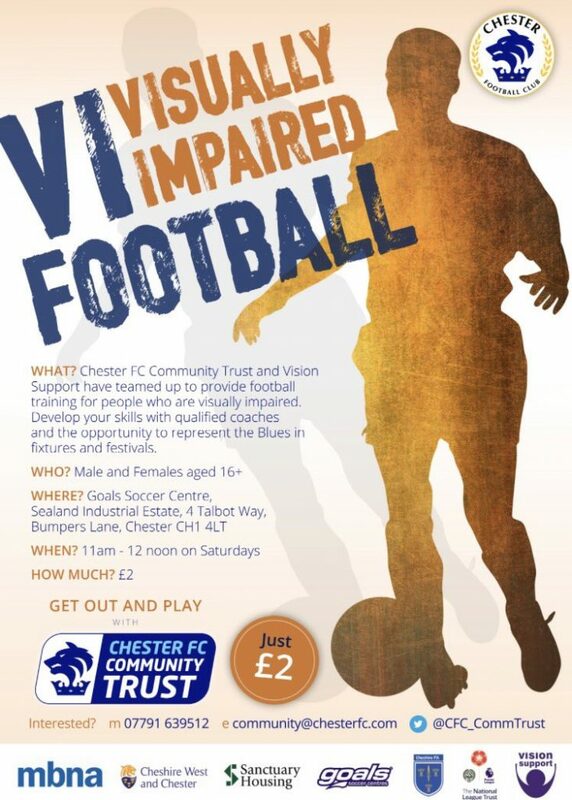 Chester FC Community Trust is pleased to announce the launch of regular Visually Impaired Football sessions in partnership with Vision Support. The two organisations have been working with Cheshire FA and following a successful pilot the sessions for male and female players aged 16 or over will now become part of the Trust’s developing disability football programme. Sessions will take place on Saturdays from 11am to 12 noon at Goals Soccer Centre, Talbot Way, Chester CH1 4LT. The cost is £2 per week and the sessions are open to everyone, not just those who access Vision Support’s services. Ben Richards, community coach for Chester FC Community Trust, said: “We had a great response to the pilot sessions and we’ve been working closely with Vision Support and Cheshire FA to develop the programme. Vision Support is a Chester-based charity supporting vision impaired people and raising awareness of their needs. The charity provides support and services in Cheshire and North Wales in line with its mission which is to enhance the quality of life, promote the continuing independence, and raise awareness of vision impaired people of all ages in our community. 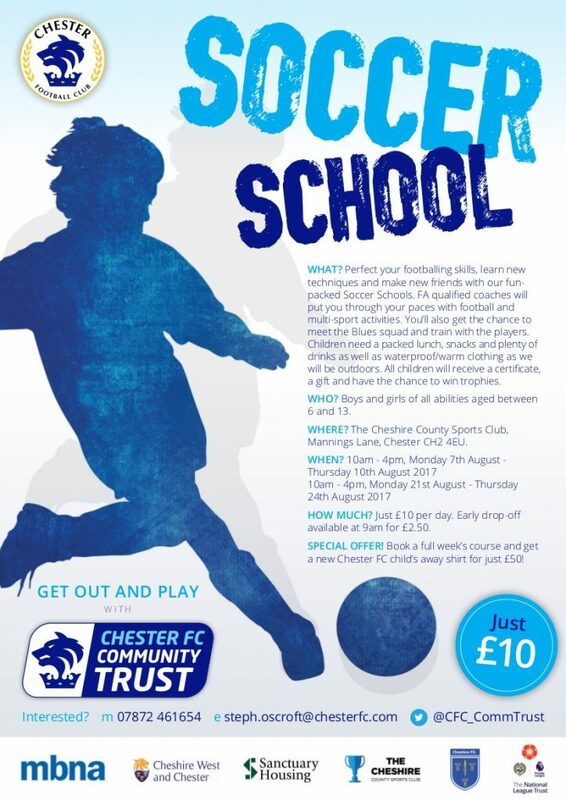 For further details or to book places contact Ben Richards on 07791 639512 or email community@chesterfc.com. Walking football continues to grow in popularity and now women in Chester have the opportunity to take up the sport. 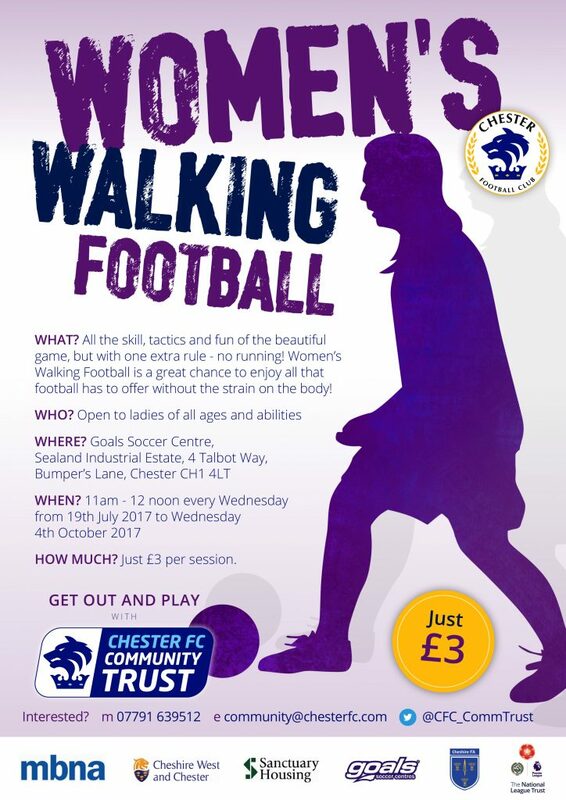 Chester FC Community Trust is starting weekly Women’s Walking Football sessions for players of all ages and abilities. Walking football is a slow-paced version of the beautiful game initially designed for the over 50s, helping to keep people active and offering a route back into playing football for those who had to stop due to injuries. As the game suggests there is no running allowed and the game is non-contact, providing a fantastic medium for regular exercise and socialising in a fun and relaxed environment. Each session will include a warm-up, football activities such as passing and receiving and games. Women’s Walking Football sessions will take place on Wednesdays between 11am and 12 noon at Goals Soccer Centre, Talbot Way, Chester CH1 4LT. The first session is on Wednesday 19th July and the cost is just £3 per session. Ben Richards, community coach for Chester FC Community Trust, said: “Walking football is for everyone, regardless of age, health and ability, but the opportunities for women in Cheshire West who want to play have been limited. “The game is a fantastic for maintaining and improving health and fitness, as well as being a lot of fun and a great way of making new friends. “Women’s Walking Football will provide participants with regular opportunities to play football and exercise without apprehension and at their own pace. 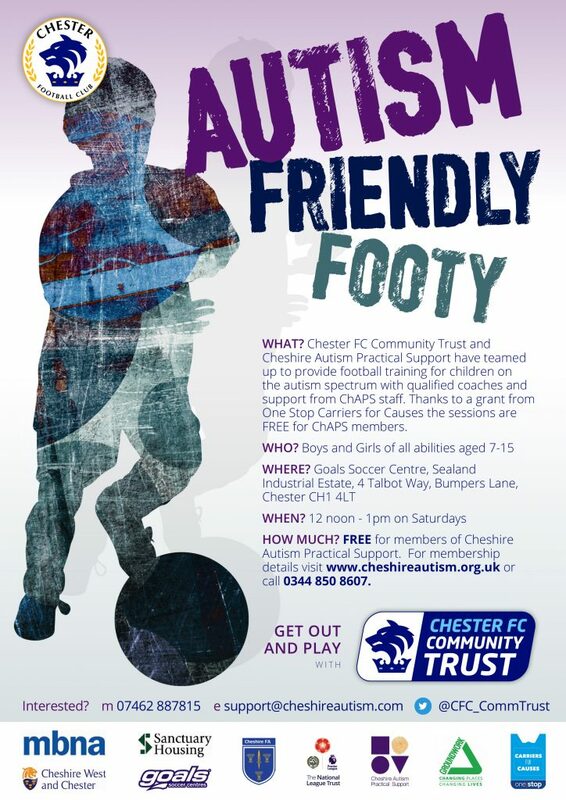 Chester FC Community Trust have launched an autism friendly football club in partnership with Cheshire Autism Practical Support (ChAPS). The Trust has secured a grant of £2,000 from the One Stop Carriers for Causes scheme to run weekly training sessions specifically for children with autism spectrum conditions. Qualified coaches and ChAPS support workers lead the sessions, which take place at Goals Soccer Centre on Saturday afternoons. Jim Green, chief executive of Chester FC Community Trust, said: “Football is for everyone and this funding from Carriers for Causes enables us to create new opportunities for children with autism to play regularly. The grant from Carriers for Causes will be used to purchase equipment for the training sessions and go towards the costs of facilities and coaches. 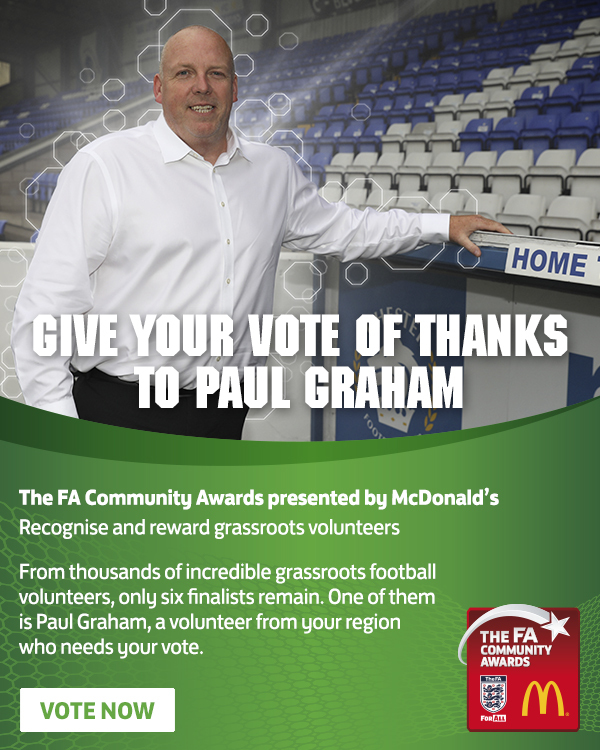 Chester FC Community Trust is backing Paul Graham to win the 2017 People’s Award in The FA Community Awards presented by McDonald’s. The People’s Award recognises an outstanding contribution to community football and Paul, secretary of the Chester and Wirral Football League, is one of six regional winners who have made a massive impact in their community, be it for their league, club, fellow volunteers or players. Paul, who lives in Blacon, has had many roles in football but the most recent as a member of the Chester and Wirral Football League committee has been his most impactful. Paul has been influential in driving local football by creating new leagues & developing playing opportunities for all including veteran players, referees & partnering with Chester FC to run coaching sessions. As a result he has turned around the league’s team decline to growth going from 22 teams to 77. The FA is now inviting football fans to vote for they believe most deserves the award and the Chester community is encouraged to get behind Paul and vote at www.thefa.com/get-involved/community/fa-community-awards/peoples-award/vote-2017. Jim Green, chief executive of Chester FC Community Trust, said: “It’s fantastic to see Paul being recognised for his outstanding service to football in Chester and richly deserved. The FA Community Awards are split into several categories and each category is judged at a county and a regional level before a national shortlist is created from the regional winners of each category. In 2016, more than 2,000 nominations were put forward for the awards in England. The national winners for each category – except for the People’s Award – are chosen by a national panel comprised of ex-professionals and past winners. The national winner of the People’s Award is voted for by the public and announced at The FA Community Awards national ceremony. This very special award celebrates exceptional volunteering efforts and carries the added prestige of being voted for by the public. You can find more information on the awards and past winners at www.mcdonalds.co.uk/communityawards.